In the old pre-Christian Russia, when the Slavs believed in the god of Thunder and Lightning (Perun), the god of Sun (Yarilo), the goddess of Water (Mokosh) and others, unusual holidays were celebrated. One of these old holidays is Maslenitsa - one of the most cheerful and beloved. 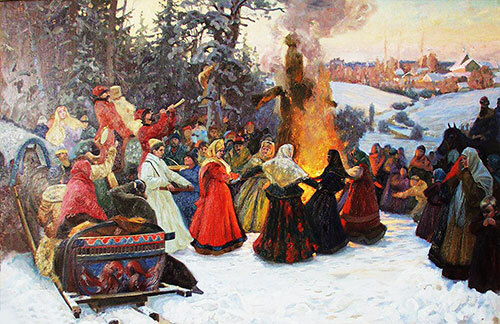 Maslenitsa is a holiday that symbolizes the beginning of spring and the end of winter. Traditionally it is celebrated in February-March (there is no fixed date) the whole week from Monday to Sunday. In these 7 days people should have fun and eat a lot of pancakes, because after the holiday in the Orthodox Church begins the Great Lent. This year, 2018, the holiday begins on February 12 and ends on February 18th. 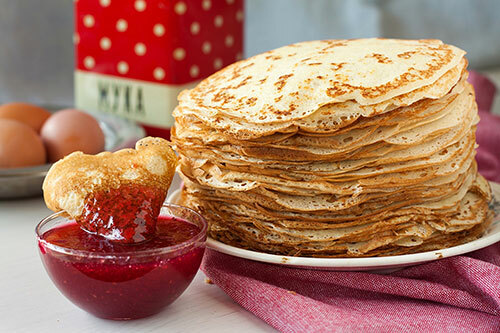 There are several variants for the name of the holiday - Pancake week, Blinschina, Masljanitsa and even Obeduha (from the word "объеда́ться/объе́сться" - eat too much, overeat). But the traditional name is Maslenitsa, or in the church calendar - Cheese Week. So, what are the traditions for celebration? The symbol of Maslenitsa is pancakes ("bliny"), which you need to eat every day of the week. Beat eggs with sugar, add milk and butter, continue beating. After add a flour a little bit, to get a good dough. At the end, add salt. The resultant dough should be poured into a hot frying pan with a thin layer (the thinner the layer, the thinner the pancakes will be). Turn over as soon as the bottom layer is toasted. After put on a plate and you can slightly miss butter, so that the pancake will not become dry. That's all. It's not a difficult process. On Maslenitsa you need to eat a lot of food, so you can often go to visit your family and friends, though every day. On the first day, on Monday - "Maslenitsa Meeting", the hostesses prepare pancakes at home, while men with children make outside a doll, a symbol of winter, which is called "Maslenitsa". Around this doll all the week long people will dance, sing, play and have fun. Tuesday - "Zaigrysh" - the day was completely dedicated to young people and especially to new families. On that day bride's bridegrooms were often held - when the groom's family came to visit the bride's family for acquaintance. And on this day, we tried to skate on ice slides. Wednesday - "Lakomka" - the most delicious day. On that day mother-in-law (wife's mother) invited her son-in-law (husband's daughter) to visit and treat the most delicious pancakes. Also were invited relatives, friends and neighbors. Popular outside games are fisticuffs and jogging. On Thursday - "Razgulay"- began Shirokaya Maslenitsa when people finished working and began to rest and have fun more actively: ride on sledges, play snowballs, dance with folk songs, fist fights and capture of a snowy city. Friday - "The mother-in-law evening" was more calm. On this day, the son-in-law (the daughter's husband) invited his mother-in-law (wife's mother) to visit relatives and friends and treat them with pancakes. Pancakes should be cooked himself, but traditionally they were prepared by his wife. Saturday - "Zolovkiny gathering" was also calm family day. On this day, the husband's sisters (sister-in-law) and his family came to visit the new family. The last day, Sunday - "Seeing off, or Forgiveness Sunday" is a farewell to the winter - people burned the doll Maslenitsa, walked and had fun on the street. In the evening, they went to the banya. This day, by tradition, they asked forgiveness from all relatives and friends to start the Great Lent from a new week. As you can see, Maslenitsa is a fun and very family holiday. In Russia winter is long and therefore the spring is eagerly awaited by everyone. And people begin to celebrate the beginning of spring in the winter month. Each year the Pancake Week begins at different dates. This week is the last week before the Great Lent, which lasts 49 days and ends with the Easter. In 2018, Maslenitsa is celebrated from February 12 to February 18. 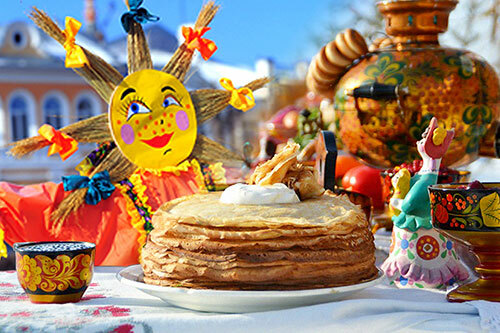 In 2019, Maslenitsa is celebrated from March 4 to March 10. In 2020, Maslenitsa is celebrated from February 24 to March 1. In 2021, Maslenitsa is celebrated from March 8 to March 14. In 2022, Maslenitsa is celebrated from February 28 to March 6. In 2023, Maslenitsa is celebrated from February 20 to March 26. In 2024, Maslenitsa is celebrated from March 11 to March 17. In 2025, Maslenitsa is celebrated from February 24 to February 2. In 2026, Maslenitsa is celebrated from February 16 to February 22. In 2027, Maslenitsa is celebrated from March 8 to March 14. In 2028, Maslenitsa is celebrated from February 21 to February 27. In 2029, Maslenitsa is celebrated from February 12 to February 18. In 2030, Maslenitsa is celebrated from March 4 to March 10.